Beveridge – Old Sydney Road, Victoria – Australia © Karen Robinson – Jan 2017. 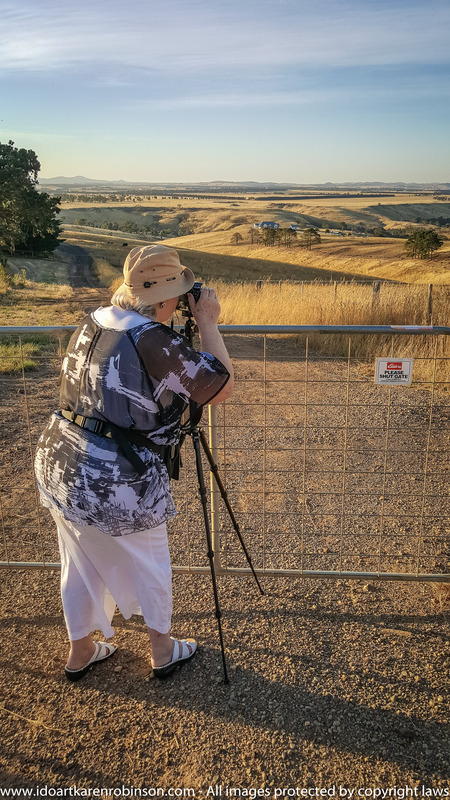 Karen photographed getting set up to take photographs with her EOS 1100D Canon DSLR camera. It was late afternoon, the ‘golden hour’ time of day and during Australia’s summer time. NB: All images are protected by copyright laws. This was my second serious landscape photography adventure! And once more my dear husband came with me to help with lugging some of the equipment, to assist with the driving, and to keep me company. He’s good company my hubby. I used my EOS 1100D Canon DSLR camera on a tripod with a remote timer for the big shots. I also used my Samsung Galaxy S6 Mobile Phone for quick spontaneous photographs and for one short video. The aim of this photography adventure was to gain some experience taking ‘golden hour‘ landscape photographs around sunset. Mickleham Farmland, Victoria – Australia. Photographed by ©Karen Robinson http://www.idoartkarenrobinson.com Jan 2017. 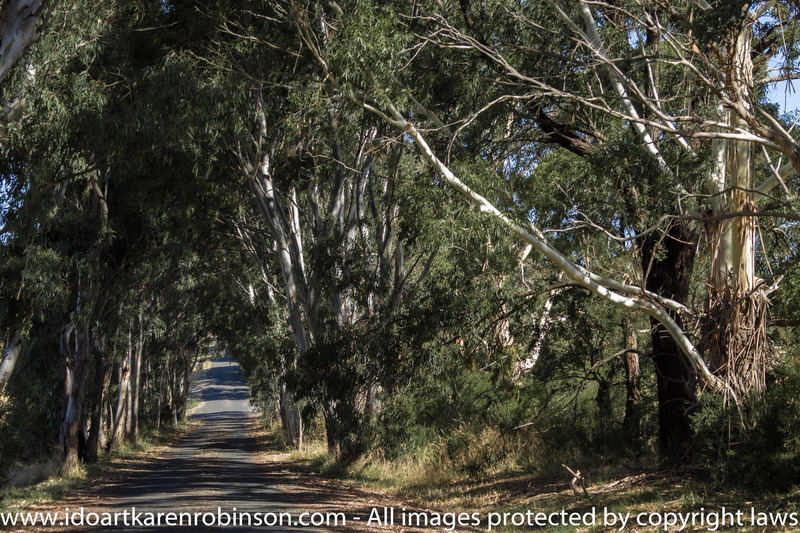 Australian Gum Trees line and arch over a road leading to isolated farm houses within the Mickleham area. 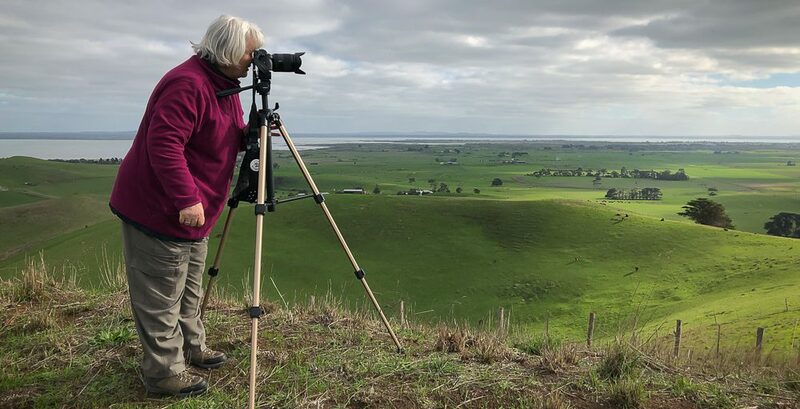 We ventured out into Mickleham and Beveridge farmlands located just on the outskirts of Melbourne, Australia. Being summertime – the farmland landscape is mostly dry golden grass fields, dotted with Australia Gum trees, and various large water holes filled to their capacity. There is the occasional sighting of cattle and sheep with the sounds of a variety of Australian native wild birds soaring within the darkening blue skies. As the sun starting setting, it shed a simmering of soft warm light across the wide expanse of these farmlands. It took two separate occasions for me to gain the photographs I wanted to achieve. During our driving around the Mickleham farmland area, my husband spotted on a fence post, a large beautiful Wedged-tailed Eagle. I managed to quickly video the eagle before it took flight into the high winds. These birds were once considered as pests by farmers. It was thought that they use to prey on their sheep. This was found not to be the case; often the Wedged-tailed Eagle was just feasting on already dead sheep carcasses. They are now a fully protected species in all Australian states and territories (Bush Heritage Australia 2017). NB: Sorry about the quality of the video – had to do it very quickly and forgot to focus my Samsung Galaxy S6 mobile phone! On my return home, I downloaded all the photographs into Adobe Lightroom 6. I developed a small selection of photographs. It was once more a new experience, especially developing the sunset photographs. Please find below the best of what I took on those days. Beveridge – Old Sydney Road – photographed by ©Karen Robinson http://www.idoartkarenrobinson.com Jan 2017. Mickleham – Farmland – photographed by ©Karen Robinson http://www.idoartkarenrobinson.com Jan 2017. Looking out into the farmland grass fields with the sun to the left at the beginning of the ‘golden hour’. The sunlight hits the side of a shed sitting at the top of a hill to the right. Featured in the valley, a large waterhole filled to its capacity. Mickleham – Farmland – photographed by ©Karen Robinson http://www.idoartkarenrobinson.com Jan 2017. Looking through a row of Australian Gum trees at the ‘golden sun’ setting on the crest of a grass field sloop. We had such a lovely experience together my husband and I watching the sunset on the horizon as the day came to a close. Immersing ourselves into the golden coloured farmlands, and re-experiencing nature’s beauty and peacefulness was a great pleasure. And then having had the opportunity to take photographs, just seemed to be a bonus. 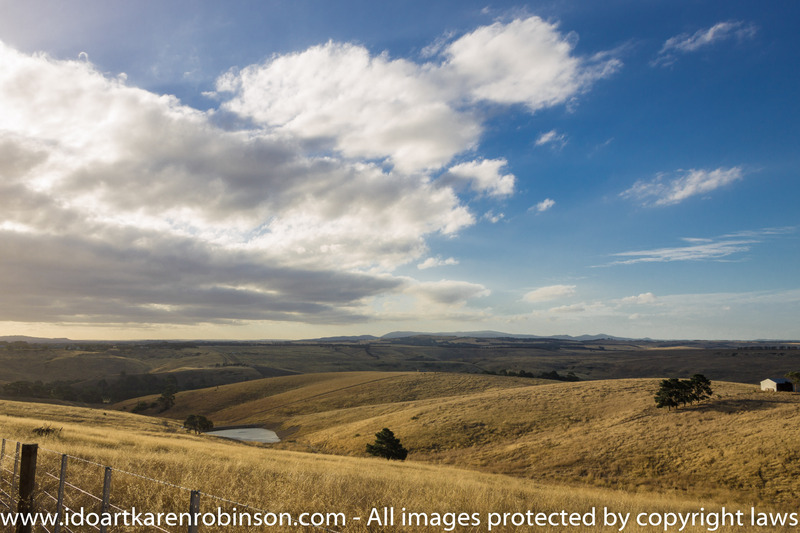 Mickleham – Farmland – photographed by ©Karen Robinson http://www.idoartkarenrobinson.com Jan 2017. 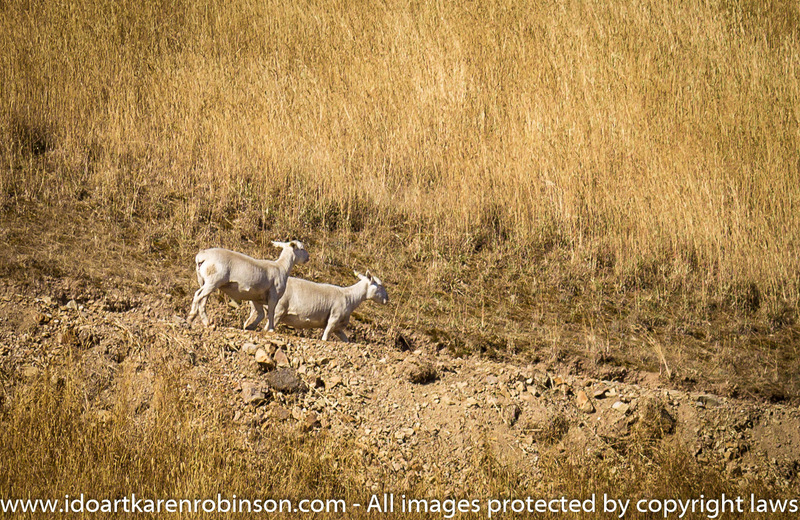 A number of freshly shorn sheep making their way down a dirt road towards the farmland valley. 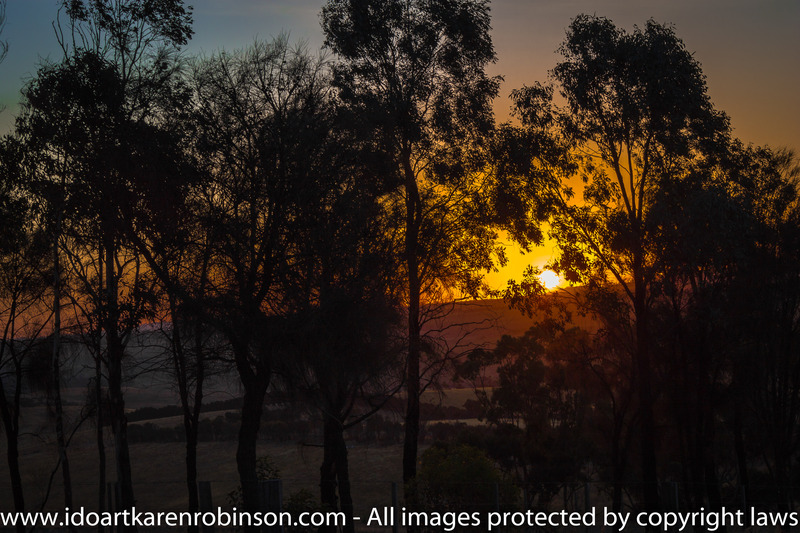 This entry was posted in Photography and tagged Adobe Lightroom 6, Australian Gum Trees, Beveridge Victoria Australia Farmland, EOS 1100D Canon DSLR Camera, Farmland Photography, idoartkarenrobinson, Karen Robinson, Landscape Photography, Mickleham Victoria Australia Farmland, Photo Journalling, Photography, Photography Golden Hour, Samsung Galaxy S6 Mobile Phone, Wedged-tailed Eagle by idoartkarenrobinson. Bookmark the permalink.